1.) Do you really wear the red coats and ride horses with a bunch of dogs like I see in old paintings? Why yes, yes we do. New members have been known to start out in less formal attire. Many of our members tried it out in western saddles. 2.) Do you release a fox to hunt? Do you kill the fox? Do you carry guns? Really, we mostly chase coyotes. There are far more coyotes than foxes in eastern Nebraska and Iowa, where our hunt countries (also known as “fixtures”) are located. It is quite rare for the hounds to kill a coyote. We chase native coyotes and they are fast and well-suited to their terrain. They are often seen leading the chase, then stopping and relaxing to let the hounds catch up and then taking off to lead the chase again. We don’t carry guns. 3.) Aren’t there a lot of obscure rules in foxhunting? I’m afraid I am going to mess up or offend someone. There are some rules, and they mostly have to do with taking care of the land and having respect for the landowners, hounds, Masters, huntsman, and people who do the work of maintaining the hunt. Pretty much everything is explained in this pamphlet, Riding to Hounds in America by Wadsworth. When you join, you will also have a sponsor who will help you with any questions you may have. Plus, this is the Midwest. We’re nice. Don’t worry. 4.) I’d like to try it, but I don’t want to run really fast or jump. Is there a place for me? Our hunt has three separate groups (also known as “flights” or “fields”) that follow each hunt. They are first flight, second flight and gate group. The gate group follows the huntsman and hounds at a walk, trot and easy canter and does not jump. Second flight riders use walk, trot, canter and jump, but not gallop to follow the hounds. First flight riders use walk, trot, canter, jump and gallop to follow the hounds. It is not unusual for the gate group to have better views of the hunt, hounds and quarry than first and second flight. 5.) What is a typical hunt like? Well, since we are looking for and following wild game over open country in Iowa weather, nothing is entirely typical. But all hunts do start and end in the same manner. Participants arrive about an hour before the start time listed on the fixture card. People unload and tack up their horses and greet each other and share some camaraderie. Guests take this time to present their capping fee and signed waiver to the Honorary Secretary or Field Secretary. This person makes sure that the details of the hunt are attended to and often keeps an observant eye on riders in the field who may need help. Riders mount up whenever they like, usually about 15 minutes before meet time. Some like to warm up their horses a bit, others just like to relax in the tack. One of the Masters of Foxhounds (NHH has three) will make announcements regarding guests, notes of interest and number of hounds hunting that day. Then the huntsman and staff will carry the hounds to the first covert. (What was that?) In regular terms, that means that the huntsman and the people who assist will lead the pack of well-behaved dogs to the place where they will use their noses to find coyotes. The first covert may be 50 yards away or may require a quarter mile trot hack to reach. Once there, the huntsman will cast (send) the hounds into the covert and they will put their noses down and hunt. It is a sight to see 30-40 dogs working together under the orchestration of a good huntsman. For many foxhunters this is the true glory of the sport. How the day proceeds from there is largely dependent on the quarry (the coyote). At the end of the day, the huntsman will lead the hounds and fields back to the meet site where the trailers are. The huntsman will blow “End of Day” a mournful but beautiful horn call. The field should listen quietly while it is blown and then thank the huntsman, hounds and staff for providing good sport. After the hunt, people take a few minutes to untack and make their horses comfortable, offering them water and hay and whatever else might be necessary. Then the foxhunters have a brunch together and talk and laugh and share stories of the day, and wonder what they ever did before they joined this wonderful club. 6.) Why are you calling them dogs and hounds interchangeably? Because it means the same thing. There used to be a rule that they needed to be called “hounds” and some do still stick to that. But the Master of Foxhounds Association, our governing body, now holds that either is acceptable. 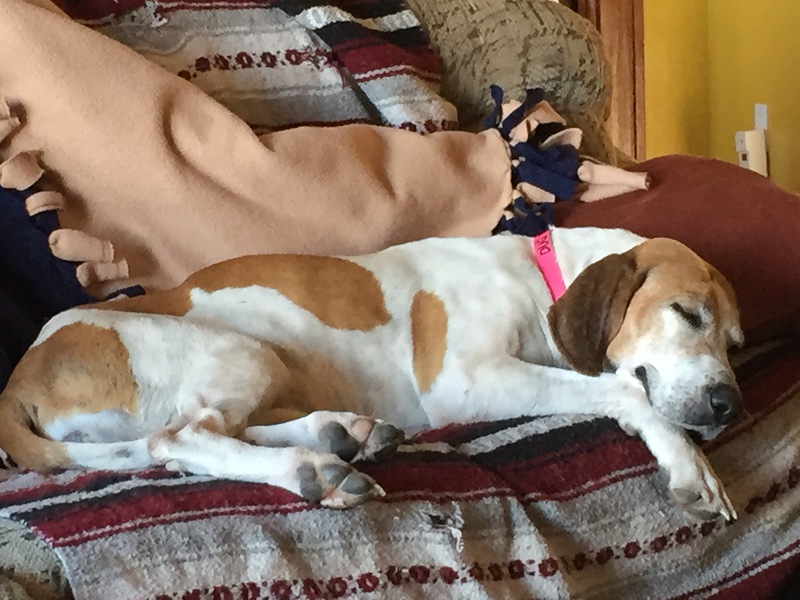 By the way, the pack that we hunt with are American Foxhounds, you know, like Jewel, who was so highly-regarded at Westminster in 2015. If you are a hound breeder, it would interest you to know that they are cross bred hounds. We have some American and some Penn-Mary-Del hounds. All the members of the NHH pack are friendly, well-mannered and like attention. In their downtime you can pet and play with them with the huntsman’s blessing. When they are hunting, though, fieldmembers should not interact with them as the hounds are working. It is just like the situation where you aren’t supposed to pet service dogs at the grocery store. Foxhounds also make wonderful pets. 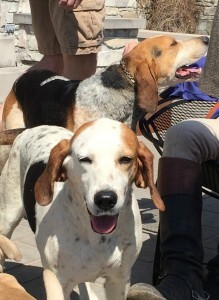 When they are retired from foxhunting, many NHH members or friends adopt foxhounds who become members of their family. 7.) What is a Master of Foxhounds? A Huntsman? Staff? Fieldmaster? Fieldmembers? A Master of Foxhounds is a benevolent being of equanimity who oversees the hunting of a foxhunting club. This person administrates the fixture card, landowner relations, hounds, huntsman and any property (kennel, truck, trailer) of the hunt. He or she is the sounding board for the membership and works to make the sport available and fun for everyone. Often times the MFH puts a good deal of his or her own money into the hunt, well above and beyond the dues other members pay. Here is much more information about the role of the MFH. The key point to remember about the MFH is he or she directs the hunt 24/7/365 while most of the rest of us think about the hunt when it is convenient to us. As a result of this kindness, effort and leadership, the MFH has many privileges that mere mortals are not afforded. He or she may ride at any place in the field that is wished, should always be given deference in any line (lining up for a coop, brunch food line, traffic etc.) and his or her jokes are always funny. A Huntsman trains and cares for the hounds. If you think it is a lot of work taking care of one dog, think what it would be like to care for about 50! The Huntsman manages every aspect of the hounds’ lives, including their breeding, care, training and retirement. The Huntsman is also an advocate for the sport of foxhunting and for his or her pack, communicating with neighbors about property permissions and taking the hounds to various functions to raise awareness and goodwill toward the hunt and hunting sports in general. The Huntsman must be a confident rider and a good hand with a horse, who is an absolutely vital part of hunting hounds. The Huntsman is always given right of way during hunting even if riders have to make a major effort to do so. Staff are the people who help the Huntsman do his or her job of hunting the hounds. They work at the Huntsman’s direction and are also given right of way. The Fieldmaster, very simply put, leads the field. The field is made up of members of the hunt and their guests. Fieldmembers should not pass the Fieldmaster. The Fieldmaster’s job is to place the field in the best position to allow the field to watch the hounds work and the hunt unfold. Fieldmembers with colors have the right to ride in front of fieldmembers without colors. General definitions of these positions are also given by the MFHA. Colors are pieces of fabric worn on the collars of hunt coats to designate members who the Masters agree have significantly supported the hunt by their volunteerism and/or financial contribution. Being granted colors is similar to earning a letter in a sport. It is an honor. Women who earn their colors wear a black coat with colors on the collar. Men who earn their colors may wear a red or black coat with colors on the collar. These members are given the privilege of riding wherever they wish to within the field, staying behind the field master Those members without colors are required to defer their field positions to those with colors. 9.) Is the Hunt Ball really a, well, ball? Yes! It is a winter celebration of all things foxhunting! A zest for life, a little pageantry, great camaraderie with horse- and hound-loving people, a silent auction of items you will really want to have, a great meal, and a full dance floor of fun people shakin’ it down. You don’t have to be a member to come to the hunt ball. You can ask to be put on the invitation list by contacting Sherma Seitzinger. The hunt ball is held in February in the beautiful Old Market area of downtown Omaha, Nebraska. 10.) What is something I never even dreamed of about joining a foxhunting club? That when you join a foxhunting club, and especially if you stay in and earn your colors, you will be a member of a worldwide club of friends. There is a vast network of cheerful, fun-loving hunt members everywhere you look throughout the U.S. and the world, and being a member in good standing of a hunt club lets you tap into it. You can go anywhere and be in touch with like-minded people simply by finding the nearest foxhunting club and introducing yourself as a member of North Hills Hunt. Here is a map of the hunts in the United States. There are also foxhunts in many other countries of the world. If you move or travel almost anywhere, you can have an instant connection to a group of new like-minded friends. We are family.